We would be happy to learn more about the perspectives and opinions of our scientists on open access publications. Therefor we’ve prepared a little questionnaire. Just visit the information desk in the library and answer the questions at the poster board. Participation is, of course, anonymous. Completing the questionnaire should take approximately 5 to 10 minutes. The questionnaire and information desk is available during the whole week. 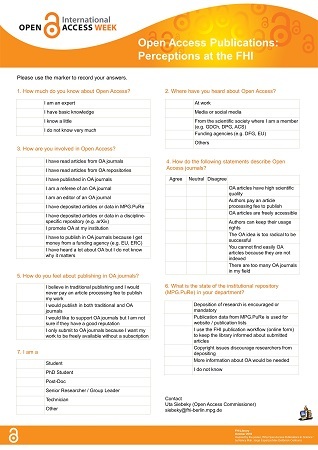 This entry was posted in Open Access and tagged FHI Library, OA Week, Poster, Questionnaire, Scientists by fhilibrary. Bookmark the permalink.